RM785 million (rated at AA3), Junior Sukuk Istina’ of up to RM633 million (rated at A1), RM240 million Redeemable Convertible Unsecured Loan Stocks Programme (rated at B3) and RM50 million Redeemable Unsecured Loan Stocks (rated at B3) on rating watch with a negative outlook. The rating watch is premised on the cessation of construction works on the Kajang-Seremban Highway in the Taman Bukit Margosa area, and potentially lower traffic plying the highway as a result of the delay in completion of the Taman Bukit Margosa area, RAM said in a statement on 30th of Dec, 2009. On 12th of Nov, 2009, LEKAS was directed to stop construction works of the highway in the Taman Bukit Margosa area, where the Seremban High Court allowed the application of an injunction order to stop work by residents of Taman Bukit Margosa against LEKAS and 11 others. On Dec 10, 2009, the hearing for the defendants’ application to strike out the civil suit which includes compensation claims of RM112 million by the plaintiffs was deferred to March 1, 2010. LEKAS has thus been unable to resume construction of the highway in the Taman Bukit Margosa area. In the meantime, LEKAS is in the midst of applying for a stay on the injunction order while the next hearing date remains to be fixed. “We highlight that there will be downward rating pressure if LEKAS is unable to complete and open the highway to the public by mid-June 2010, which will result in loss of tolling revenue, or if the company is found to be liable for compensation to the plaintiffs,” RAM said. The rating agency said it will continue to monitor the traffic volume of the highway. “We have highlighted that it is imperative for the traffic volume to reach 65,000 average daily traffic during the first full year of operations, with long-haul commuters who travel from Seremban to Kuala Lumpur city or vice versa making up at least 50 per cent of the total traffic volume,” it said. “There will be downward rating pressure if the traffic volume build-up is slower than expected,” it added. Islamic financial services provider Shariah Capital has appointed commodity and derivatives expert Malcolm Wall Morris, 38, as a non-executive director. He replaces David Rutledge, who has stepped down from the board from 29th of Dec, 2009. Wall Morris, formerly CEO of DGCX, the Dubai Gold & Commodities Exchange, has also replaced Rutledge as CEO of the Dubai Multi Commodities Center. Rutledge recently retired after six years at the DMCC. Shariah Capital is a U.S.-based company that creates and customizes Shariah compliant financial products and platforms and provides selective Shariah consulting and advisory services primarily to global financial institutions and investment firms with product initiatives directed to Islamic investors. Sudan’s central bank has given its approval for the fully Islamic US$200 million Emirates and Sudan Bank to be set up in Khartoum, the country’s capital; it was announced on Dec 28th, 2009. The new bank, which is backed by a number of leading Islamic financial institutions, is expected to begin operations in January 2010 and plans to quickly expand out of its Khartoum headquarters and create a network of branches throughout the country. All its operations, services and products will be fully Shariah compliant. The crucial backing of Sudan Bank, the central bank, has opened the door to the full establishment of Emirates and Sudan Bank with a declared capital of $200 million and paid capital of $100 million. Dr. Mohammed Khalfan Bin Kharbash, UAE Finance and Industry minister and chairman of the founders’ committee of Emirates and Sudan Bank, said: “Our aim in setting up this bank is to support the economic development of Sudan.” Dr Kharbash, who is also Chairman of Dubai Islamic Bank (DIB), added: “The creation of the new bank draws tighter the historically close ties between Sudan and the UAE, a great supporter of economic and trade cooperation between Arab countries. He added: “UAE investors reacted enthusiastically to the opportunity to set up the bank. “Sudan’s economic indicators are generally positive and forecasts for gross domestic product, balance of payment, balance of trade, exchange rates, and foreign investments suggest that the country is poised for an economic upswing, particularly after the latest developments to do with the peace treaty. “It is crucial to the country’s further progress that it has solidly established banks and financial institutions with the resources and facilities to offer a service that can facilitate international transactions.” Dr. Kharbash confirmed the bank would soon begin to offer a full range of Shariah-compliant services and products that meet the needs and requirements of all sections of the Sudanese community, both business and retail. He added that the bank would perform a crucial role in inter-bank and regional financial transactions and investment. A range of retail and corporate banking services will be offered and Emirates and Sudan Bank has confirmed it will invest in developing local staff to service its planned branch network. Sudan has become a magnet for investors, businesses and financiers since the signing of a peace treaty between the north and south of the country. It is believed to have large reserves of oil. This bank is a top 5 institution in Saudi Arabia with a very good network and client list. They have about $1bn in funds under management and need to hire someone who knows the Saudi market and also can speak Arabic. This is an excellent opportunity to join a firm that is growing and building a very strong brand name in the GCC region. Azerbaijan is preparing a set of agreements to be signed at the 35th annual meeting of the governors of the Board of the Islamic Development Bank. The agreements on two projects are estimated to be worth $200 million, according to a government source. “We are also working on a project with the Saudi Development Fund, which may be signed during the annual IDB meeting as well,” the source said. 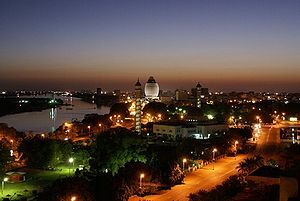 The annual meeting of the Islamic Development Bank will take place on 23-24 June 2010 in the Gulustan Palace in Baku. A specialist mission of the bank is to visit Baku this week to work on preparations for the meeting. The chairmanship of the IDB Board of Governors will be held by Azerbaijan for the first time in 2010. Since Azerbaijan entered the IDB Group in 1992, the bank has given the country financial support of $280 million.